Children sit in a shelter run by a church in Portoviejo, Manabí, in Ecuador. More than 280 schools have been damaged by the earthquake that hit Ecuador on 16 April, leaving up to 120,000 children temporarily without education, the United Nations Children's Fund (UNICEF) has said. UNICEF said that a total of 250,000 children have been affected by the earthquake. The agency is supporting the Government's efforts to get children back to learning, particularly in the worst-affected areas of Muisne, Pedernales, Jama, and some parts of Portoviejo, Manta and Chone. UNICEF will install 50 temporary learning spaces for 20,000 children and distribute 700 School in a Box kits with school supplies to benefit 60,000 children. The agency said that while aid and government agencies are still assessing the full extent of the damage, initial estimates indicate that nearly 2,000 buildings have been damaged or destroyed and some 30,000 people are staying in shelters. Fear of aftershocks is pushing people to sleep outdoors, exposed to the heavy rains that are common during this season. UNICEF and its humanitarian partners need $23 million to respond to children's immediate needs in water, sanitation, education, child protection, health and nutrition over the next three months, the agency said. 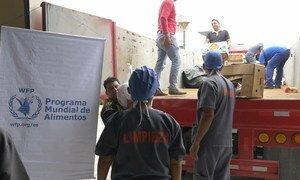 The United Nations World Food Programme (WFP) announced today the start of an emergency operation to assist 260,000 vulnerable and food insecure people seriously affected by the earthquake in Ecuador and in desperate need of food and other basic necessities.